↑ ۲٫۰ ۲٫۱ National Population and Housing Census 2011 (National Report). Central Bureau of Statistics (Nepal). آرشیولنیب اصلی نۆسخه‌دن on 18 April 2013. یوْخلانیلیب26 November 2012. 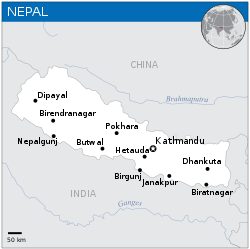 ↑ 2011 Nepal Census Report Archived 18 April 2013 at the Wayback Machine. ↑ Shrestha, Khadga Man (2005). «Religious Syncretism and Context of Buddhism in Modern Nepal». Voice of History 20 (1): 51–60. ↑ Nepal5. Royalark.net. یوْخلانیلیب14 February 2014. ↑ ۷٫۰ ۷٫۱ ۷٫۲ ۷٫۳ Nepal. International Monetary Fund. یوْخلانیلیب12 March 2016. ↑ Error on call to Şablon:cite web: Parameters url and title must be specified. United Nations Development Programme (2017). یوْخلانیلیب22 March 2017. بۇ صفحه‌‌ سوْن دفعه ‏۷ فوریه ۲۰۱۹، ‏۰۷:۴۰ تاریخینده دَییشدیریلمیشدیر.